First let me say Sorry no pictures. They normally send us home with a USB thumb drive loaded with pictures as there are 3 photographers running around camp so we can focus on training, however when I got home the drive was broken and wouldn't work. I tried it on 3 different computers. They are sending me a new one, so when I get it I will post some photos in the photo section. There are some really good ones too as we had a camper with a wet suit and underwater camera this year getting some different perspectives of dogs going in the lake. I do have some pictures I took with my phone but not many and those were at relaxed moments. I will start with the sad news. We had a lot of fun but a little sad moments. This year 19 dog scouts crossed the rainbow bridge which was a lot. Reese which many may remember me mentioning many years before who has come every year we have been going was a service dog. One of the largest Goldens I ever seen. His owner, Terri, is in a wheelchair and has seizures and he could get up on the wheelchair and brace her before a seizure even happened, then go get help when it was finished. He also did wilderness search and rescue, and agility and rally and so many other fun doggy things. He passed earlier this year from cancer. She was there though with her new service dog, creating a bond and learning new things, but ytou could see she really missed him. I can't remember the new dogs name without my USB drive and info, but she did earn her Dog Scout Title and a few others badges. Another lady Barb, who has been coming to camp every year, lost her dog Danny unexpectedly to cancer as well last month. She came to camp as well to help out and just be there with fellow campers. Chris, one of the trainers lost 2 in a month earlier this year and Beth another one of the trainers lost her German Shepard Reggie as well who was Hemi's adult dog partner when Hemi learned wilderness search and rescue. I think that's it from our camp, however everyone was there. So while none of those dogs were mine, I met and worked with all those dogs and they all have a little place in everyone's heart at camp. So, now on to the fun. Last year, Hemi was having a lot of control issues, as he broke 2 collars and 1 leash, he would lunge and just try to go where he wanted to go. So we made serious efforts to walk to the lake and if he lunged at the leash, he didn't get to go swimming, we turned around and went back to the RV. He only got to go swimming 2 days last year of the whole time at camp and once of those was when he broke his collar trying to get to the lake and so it wasn't intentional. I am happy to say Hemi got to go swimming every single day. We walked calmly down to the lake and once I took the leash off then he knew he could go. This video I took Sunday after we arrived and set up I decided to test this. VIDEO0057_zps9irzwnm7.mp4 Video by bound4doom | Photobucket Hemi has not forgot the dock or the fun of camp, he knew exactly where we were. This is where he learned to dock dive after all. 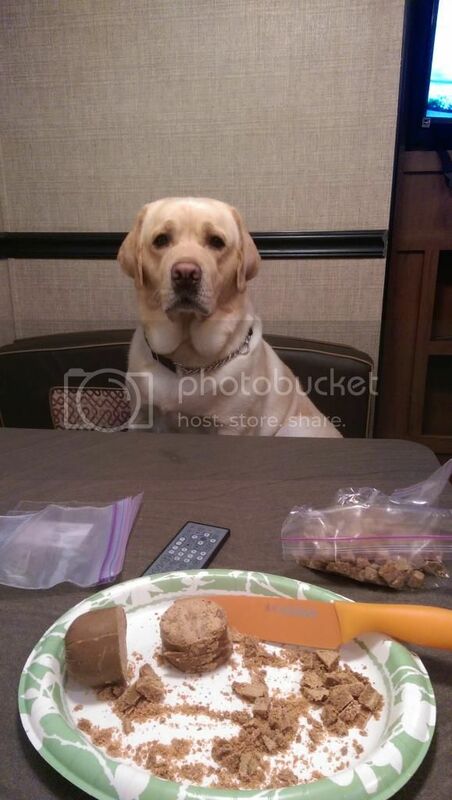 After Swimming we went back to the RV and cut up treats. 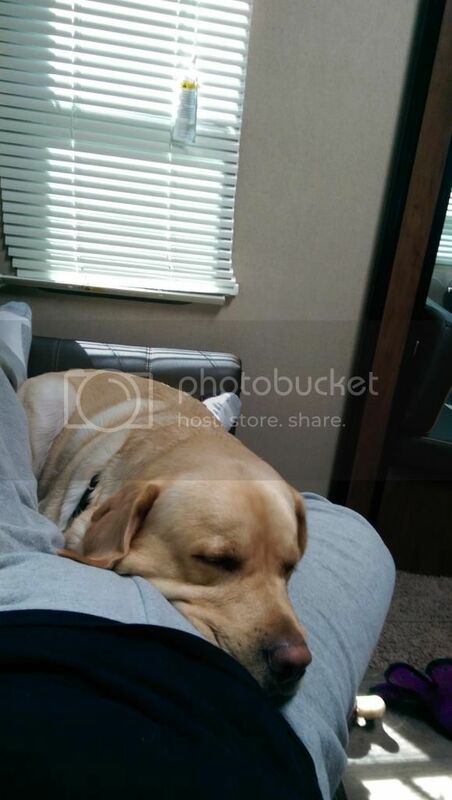 I do let him up on the benched in the RV while I am not eating so he can look out the windows. However, I didn't foresee the problem with me cutting up treats. This was my view every time I fixed treats. We do have some other issues this year to work on now. With all the other dogs and Hemi being unneutered, dogs either didn't like him because he was pretty much the dominant male there or at least smelled like one having all his testosterone. And he was obsessed with sniffing the floor and looking for places to mark, I mean obsessively where even treats weren't welcome. So I have been tossing and turning the idea of neutering Hemi. I am trying some other things, but I am thinking after the fourth of July holiday when we have some down time that Hemi might loose his balls. I like him having his hormones, but his hormones are running wild to the point where in certain situation he is not listening to any commands or willing to do anything but be on the hunt for a mate. Plus a lot of other dogs show aggression towards him even when he isn't doing anything but laying on the floor. Camp really put a focus on this, however I have noticed this starting to go on more and more in the last few months. With all this extra obsessive things, it sure made camp a lot more difficult. While Hemi can dock dive, I still can't get the dock diving badge, he wants to run off with the other dogs and won't come back to the dock and up the steps. 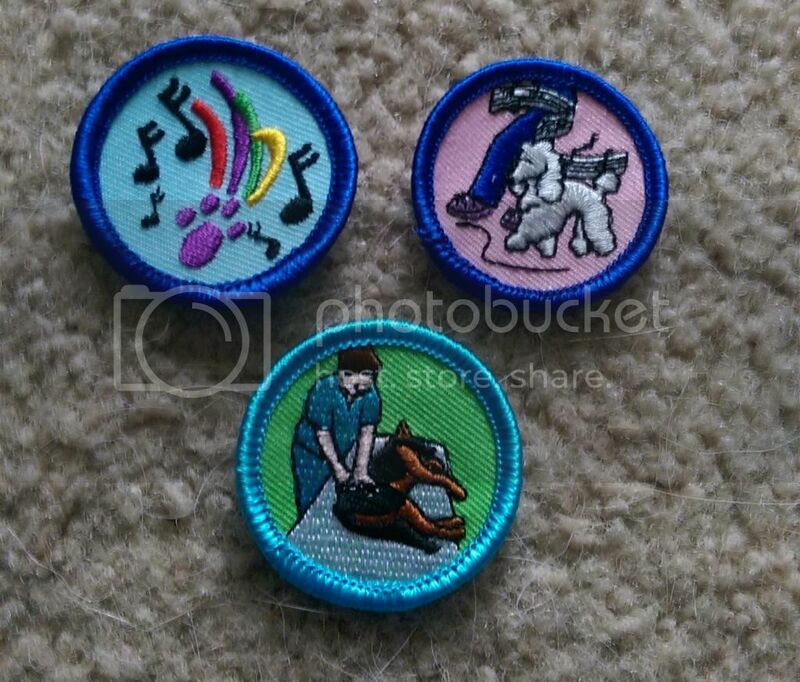 Hemi earned 3 badges this year, Canine Musical Band. This is where he played the piano with his nose. He had fun but then he realized other dogs all around him were having fun, so he kept trying to play their instruments. He even stole the piano from Terri's new service dog. He hooked his dewclaws right around it and even though I had him tight on leash he had a death grip. The other dog just looked at him then at Terri like, he just stole my piano. I gave it back as soon as I could wrestle it away. He also got his Canine Massage badge. Which was hard in a room full of dogs to lay down be good and accept a massage on a mat. This was more my test though and on my knowledge. He earned his Canine Musical Freestyle badge. This was the Novice badge. The intermediate and advanced are going to take a lot more work than we can get done in a week. However, that's ok, it gives us goals. We came very close to getting his rally free badge. He just couldn't complete the course. With his distractions from sniffing everything and the fact the lake was 10 feet from the rally free course didn't help either. We would do a move then it was, ok can I go swimming now. Another time a lady was swimming her dog and all he wanted to do was join in and her dogs came running through the course several times. More on that later though, Hemi got his revenge. He was able to do all the moves on both the right side and left side however, when it came time to do the actual course, he was just too distracted. Not a big deal though, we just need to set up a course at home and do it there while filming it and he will get his badge. Everything else is done. We started in on his Biking Badge and First Aid badge. More to finish there. Also, keep doing the lab board challenges, you never know when they will come in handy. Remember challenge number 1 where you teach a dog to limp. Well to start that you need to teach them to lift a front leg and hold it. This is actually a move in Rally Free. There are 2 different signs, one for each paw. We wouldn't have passed this if we hadn't learned that from the lab board challenges. Here is the 3 badges Hemi earned at camp. We didn't do the barn hunt. It was at the same time as rally free and with all of Hemi's other distractions, I figured right now was not the time to teach him to hunt rodents. However for those that did it, they really enjoyed it and had a great time. Terriers really excelled at the sport but all dogs did it. For biking, the dogs scouts have safety in mind, for the human and the dogs. We use an attachment to the bike called a springer http://www.springeramerica.com/ then we also use a Sure-fit harness Amazon.com : PetSafe Surefit Dog Harness, 1 Large, Cadet Blue : Pet Harnesses : Pet Supplies The sure fit harness I had not used before. It's actually a really great harness. It is not a no pull harness or anything, but a way to attach to the dog but gives them full use of the front legs. This is great for biking and the attachment is on the top. Then this year Gloria Voss was back, Welcome to Gloria Voss World with Dogs She is an expert in Canine musical freestyle. She missed last year because of a surgery. However she is one of the sweetest ladies you will ever meet. She loves all dogs and she loves to dance. She has been doing Canine Musical Freestyle since about the beginning of the sport. She is a judge in the sport and well an expert with dogs like all the trainers. She worked with Hemi and I a lot and was able to teach us so much in just the short time we were there. I had trouble with Hemi doing leg weaves. In one day working with me, most of the issue with training him on legs weaves were my issues, she had us doing regular leg weaves while walking, changing directions, doing figure 8 leg weaves while I was standing still, figure 8 leg weaves using my body and a cane. He learned to back up around me doing circles, his heel improved at least 10 times better. We adjusted his music to meet his speed. She was fantastic to work with and most of all both Hemi and I had fun. Every day we were totally exhausted. we usually had an hour or two mid afternoon with nothing on our schedule. So we took naps on the couch in the RV. Then like every year they have a masseuse come in every night for massages for the humans. It costs extra but so worth it. Friday night I got my massage and oh did I feel so much better. I decided I am no spring chicken anymore. I took some Advil a few night I was there before bed but that massage hit the spot. So Friday night our last night, after I got my massage, Hemi hadn't been swimming yet that day. Its so easy to say no and relax, but that just wouldn't be fair. So I got his bumper and we headed out. A bunch of people were up at the campfire just relaxing, camp was ending and wrapping up. The lady who was swimming her dogs while Hemi was trying to work was sitting up there with her tired exhausted lab and golden. They were quite far away, so I didn't think anything about it. I let Hemi off leash and launched that bumper deep into the lake and Hemi took off like a rocket splashing and swimming. I then hear all this commotion by the campfire. Hemi had a cheer leading squad that wanted to come swimming too. Yanked that poor lady right out of her chair. Hemi got his revenge. We got done swimming, and I toweled off a tired Hemi and went and took a shower. I got out of the shower and this is what I see. A tired and satisfied little boy. All in all it was another great camping experience with some of the greatest dog people on the planet. We have things to work on and things to do. We will definitely be going back again next year. I love your stories, you made me laugh, cry and laugh hard enough to cry! Sounds like a wonderful time, I look forward to the pictures. Hey! I saw you post and had to come see how camp went!!! Sounds like you had a little bit of struggle with distractions but overall a really great time! Congrats on your new badges! I hope you can get the new pictures up soon. Is that k9 magic? Looks similar! LOL I love that face Hemi is making. Burton makes the same starved face every time there is food out. 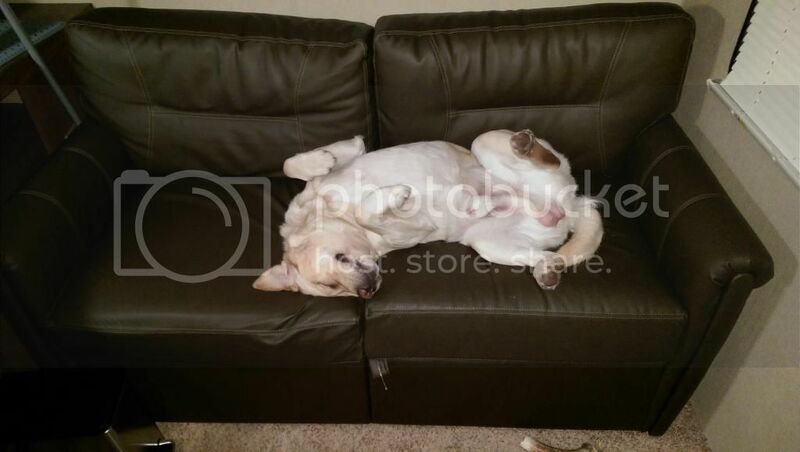 Similar to K9 Magic, this was a new retriever roll from Natural balance, Duck and Turkey. Hemi likes the duck, and the turkey, so I figured why not duck and turkey together it one roll. It was really really crumbly for some reason so I don't think I will be buying that combo again. But I did find another one that is really good, it cuts up like Ham and cubes nicely. I can't remember the name though I saved the wrapper I have to find it and look it up. One of the trainers at camp introduced me to it and it is made here in Michigan with local products. Sounds like an awesome time!! Thanks for the report! Love the update! Glad you had a great time! Sounds like Hemi just loves it. What an awesome time for you and Hemi! Congratulations on the new badges. Really had to laugh at Hemi's revenge. I've heard of Gloria Voss. Sounds like the two of you probably need a good week of rest and recharging. Thanks for the great pictures and looking forward to the others.